The Epic Games Store is opening soon to all game developers and it’s launching a massive challenge to the leadership established over the years by Valve with Steam. It’s doing so by significantly reducing the revenue split fellow developers will face compared to the established norm with Steam. 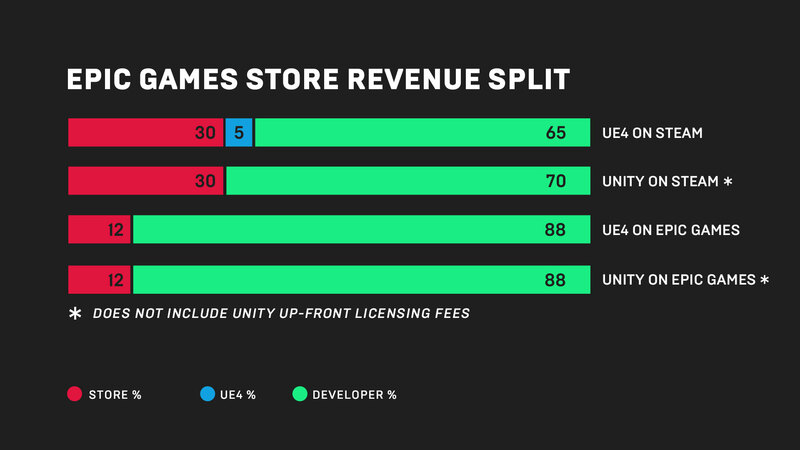 On the Epic Games Store, 88% of revenue will remain in the hands of developers, whereas on Steam traditionally only 70% of revenue went to game studios while Valve kept the other 30%. A few days ago, Valve revealed a change for the revenue split where their fee would drop from 30% to 25% beyond $10 million in revenue and from 25% to 20% beyond $50 million. In retrospect, this hardly seems like a coincidence. Perhaps Valve caught wind of what Epic was about to do and tried to make a move hoping it would soften the blow. It will be extremely interesting to see how game developers react to this news. It cannot be but good news for them, honestly, as more competition in this sector will surely improve the situation for them. In turn, creators should be able to retain more revenue for their games than before, which would be good news for all gamers as a whole.